The night sky, at least when you can see it, appears placid, serene and as inviting as a cold brew on a muggy afternoon. Don’t be fooled. The real universe is a nasty mélange of stuff that’s mostly scorching hot or bitterly cold. The blackness of space is shot through with lethal particles and radiation. Without doubt, the “final frontier,” often depicted as a beguiling playground for our Spandex-attired descendants, is deceptively treacherous. Not only that, it’s out to get you. How’s that? Well, you can start with the usual litany of heavenly harm: Asteroids that can mindlessly cannon our world, revenging their own destruction with ours, or solar flares, which could fatally sicken any humans who dare to rocket themselves to Mars. Then there’s Mars itself, which even on a good day is less hospitable than the worst environment on Earth. This cast of cosmic unpleasantries is well known. But there are other baddies whose malevolence is on a grander scale. Consider gravitational waves. Their discovery is trumpeted as perhaps the most significant science result of the past thousand days. The waves themselves are feebler than the Lichtenstein Navy, as anyone who has read about the LIGO instrument knows. But that’s because these waves come from far away. The slight shaking of space-time that made the headlines in February resulted from the collision of two black holes having a combined mass of five dozen suns. Their mutually assured destruction quickly released as much energy as all the stars in our galaxy have belched into space since Aristotle wrote rhetoric. That prodigious, black hole crash twiddled the cosmos here at Earth, more than a billion light-years from the collision, and it may also have let loose a burst of radiation which, if you were near enough to the action, could ruin your whole planetary day. It was an explosion of incomparable vigor, and explosions can be dangerous. But you may figure this is someone else’s problem, and maybe not even that. After all, who’s going to be hanging out in the vicinity of a pair of suicidal black holes? But there’s another threat that’s more worrisome: Gamma Ray Bursts, the result of a slightly different variety of cosmic mishap. When large stars die, they don’t go gently into the night. Single stars can implode, or two small, dead stars can collide. 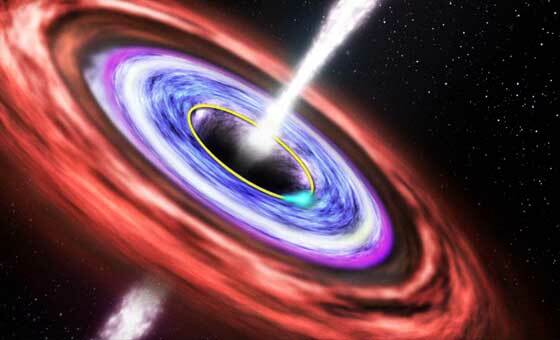 Either way, the resulting black hole is celebrated with a brief flash of gamma rays a million trillion times brighter than the Sun. Because most of this energy is shot out in two, oppositely directed beams, it’s highly concentrated. It could damage the atmospheres of planets even light-years away, which would be bad news for any biology. GRBs are not rare. Astronomers find a new one just about every day. And this points out the fact that the universe is a war zone in which random and lethal explosions occur in the star clouds of every galaxy. This has led some scientists to speculate that the majority of cosmic real estate is essentially a no man’s land for life. A recent suggestion is that GRBs rule out 90 percent of all galaxies for life, and even the Milky Way is probably barren except for its outer realms (where we are). That may sound like really bad news for biology. But wolves in the forest are bad news too, although there are still plenty of creatures out there. Only 15 percent of Earth’s surface is arable, but nonetheless, there are billions of humans. So sure, most cosmic real estate may be worthless, but that may be OK. However, the discovery of these mega-dangers does raise a maddening question: Why is the universe set up in such a way that GRBs don’t happen a hundred times more often, or aren’t a hundred times more energetic? After all, if that were the case, you wouldn’t be reading this. And there would be no one else able to read it either, in all the vast expanse of space. Are we that lucky? If you believe in multiple universes, then maybe the correct answer to that question is yes. Sure, most of these hypothesized, other universes would be sterile. But not ours: we’re just a winner in the most powerful of powerball lotteries, marveling at our fortune at being in a cosmos that is at least partially habitable. If this seems too contrived — if you’re not a fan of this idea — then science can’t help you. Yet.